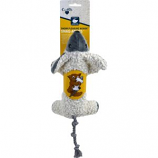 • Designed To Appeal To Your Cats Natural Instinct To Play and Exercise. • Sure To Keep Your Cat Healthy and Happy! • Toy Is Filled With Catnip. • Stuffing Free and Catnip Filled. • Bring Out Your Cats Natural Hunting Instincts With Out Realistic Skinneez For Cats. • Cats Will Enjoy Hours Of Entertainment Pouncing On and Batting At Our Stuffing Free Skinneeez. 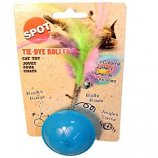 Cat teaser wand with feather boa and catnip toy the cat toy is brightly colored and the catnip attracts the cat attention. • Contracts Into A Ball By Pinching The Ends Together. 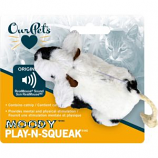 Makes the perfect gifts or stocking stuffers for your favorite feline!. 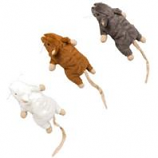 Appeals to your cat's natural instinct to hunt chase pounce and play. Interactive fun for you and your cat. 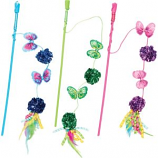 Irresistable spring action toy gets older cats moving. .
Fun teaser wand with fluttering butterflies and mylar balls. Shine and crinkle sound entices kitty to play. Interactive play. . .